Ever wonder about those parents who rally in the streets with a baby strapped to their chest? Have you thought about teaching your kids firsthand about civics and democracy but can't imagine how you would actually find the time, or patience, to haul them to a political protest or bill-signing? When it comes to politics, Seattle mom Erin Gustafson’s not afraid to speak her mind. Neither are her children, 9-year-old Anna and 7-year-old Kyle. Since 2009, Gustafson has been nurturing mini-activists. “I’ve taken them to school board meetings where I’ve testified. We’ve gone doorbelling for candidates, and last winter I brought them when I testified in front of the state Senate K–12 Education Committee,” Gustafson said. Like many parents who are propelled to get involved in changing the system when politics become personal, Gustafson’s activism started four years ago when her daughter’s kindergarten teacher was laid off. “He was incredible. It was so upsetting to the parents. We just stood on the playground and sobbed.” That’s when Gustafson sprang into action. “I thought, ‘What can I do?’” and she started showing up at school board coffees, testifying at formal school board meetings, and joining groups that were changing policy, she said. “Citizens can influence policy. It’s hard to do against special interest groups that lobby full-time, but it’s possible to make a change,” she said. Eventually her lobbying landed her a job as policy director at Teachers United Washington. Kids can foster change in a variety of ways. Gustafson’s kids have helped display signs in their window at home. They’ve been to the state Senate, and they’ve tagged along to meetings to hear testimony. Seeing the political process is good for them, and they’re good for the political process, their mom believes. When Gustafson brings her kids door-to-door campaigning, she says having them along actually gives her an edge. “Doorbelling on my own, I’ve had people yell at me and slam the door in my face. With my kids, they say ‘Oh how cute!’ and they’re less inclined to shut the door on us.” Taking the kids to testify about schools in Olympia lent Gustafson more credibility, as legislators saw her as a parent with children in the school system. “My kids are learning that individual people can make a difference. They can have their voice heard. It’s easy to get really jaded about people in power and wonder, ‘What can I do as an individual?’ You can band together with other individuals to make your voice heard and make change for the better.” Through their participation, kids learn that they can ask questions of people in authority. They learn what special interest groups are. “They won’t roll over and give up and say, ‘There’s nothing I can do,’” said Gustafson. Gustafson’s kids are learning the difference between state and local government, and how a bill becomes a law (today’s kids don’t have “Schoolhouse Rock”). “I didn’t even understand the details of the process until four years ago,” Gustafson laughed. And most importantly, her kids will be well-informed and they will understand how important it is to vote. Since Rebecca Rockefeller strapped on her Ergo carrier to protest George W. Bush’s second term, her girls, Ava, 9, and Mira, 6, have been mini-activists. They march in parades, make signs, meet local legislative candidates, and attend city council meetings. They’ve gone to the Capitol to watch floor debates and gone to a bill signing. “I go to protests that I feel passionately about and I’d like my kids to see. We do a lot of discussing at home,” Rockefeller said. 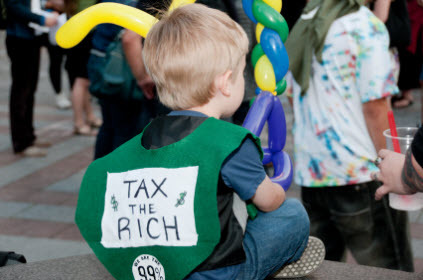 For the Occupy Seattle protests, Rockefeller dictated words while the girls made signs. At the protest, they spent the evening standing on a corner waving at people. Activism became personal to the girls three years ago, when they became citizen scientists. They discovered a trash problem on Bainbridge Island during Ava’s homeschooling and began documenting it just in time for the Bainbridge bag-ban ordinance. Ava started public school in second grade, and in fourth grade, she collected trash for 10 minutes in her neighborhood and 10 minutes on the beach, documented it, went to a city council meeting with her mom, and stood at the podium while her mom testified. Her experience became her school science project. Rockefeller’s father was state senator Phil Rockefeller, and yes, she is distantly related to the prominent family. Her girls spent time in Sen. Rockefeller’s office and on the House floor. Once they got to sit next to the governor at a bill signing. Governor Gregoire gave the girls pencils, told them about the bill and made funny comments. “Now they get how laws become laws,” Rockefeller said. If you’re all fired up about an issue and want to get involved, you can start small. Maria Bellos Fisher is a blogger, freelance writer and mom who often misplaces her mail-in ballots. Read her blog, “Hereditary Insanity: Surviving family by the grace of madness." Bring home some civic-themed books and start reading them with your children. Check out our book guide here! Ask your kids what issue at their school they feel isn’t fair or right or needs improvement. Discuss what step your child could take to make a change. Visit the state Capitol and the U.S. Capitol (you can even start with a virtual tour). Many families incorporate governmental or historical sites into their family vacations. Check our resources for visiting the state Capitol and Legislature's kids page. Write a letter with your children to your local legislator, the principal of their school or the President of the United States. Have your child help you register to vote. Take them to a polling place or have them help you fill out your ballot. Attend a rally or protest and watch a presidential debate with your kids. Talk about why people protest and vote and what it would be like if we couldn’t do these things.